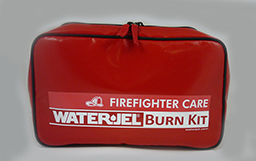 Be prepared for firefighters' burns on the job with this heavy duty, moisture-resistant burn kit that includes Water-Jel's new First Responder Series Burn Dressings with our new Clear Gel formula. 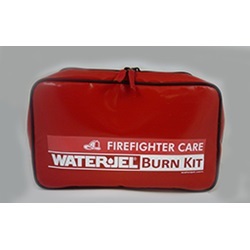 Water-Jel burn dressings help stop the burn and stop the pain by cooling burn injuries fast, on the scene. Any of these burn dressings can be used for burns anywhere on the body - face, hands, neck, wrists, arms, chest, back, legs and feet. Five-year shelf life for long firefighter preparedness.